Moku‘ula is the site of the private residential complex of King Kamehameha III from 1837 to 1845, when Lāhainā was the capital of the kingdom of the Hawaiian Islands. The site is a traditional home for Maui royalty, noted as being the site of King Pi‘ilani’s residence in the sixteenth century. Almost the entire site, which consisted of fishponds, fresh water springs, islands, causeways, retaining walls, beach berms, residential and mortuary buildings, was buried under a couple feet of coral and soil fill in 1914. Under a County Park for over a century, the site is in the process of being uncovered and eventually restored by the Friends of Moku‘ula and others. Although most widely associated with the period of Kamehameha III, the site appears to be a place of traditional Native Hawaiian cultural significance. The islet of Moku‘ula, located in the fishpond of Mokuhinia, was a sacred place protected by royal kapu (taboo). The goddess was a deified princess, daughter of Maui king Pi‘ilani of the sixteenth century, whose family resided at the site. Kamehameha I, upon his conquest of Maui in the late eighteenth century, adopted this deity. His sons and successors, Kamehameha II and III, were of the indigenous Maui royal family through their mother, Keōpūolani. The lizard goddess Kihawahine ranked in no small part as the guardian of the succeeding Kamehameha dynasty that was in the process of unifying the archipelago. A continuing association of religious function, as a shrine to Kihawahine, continued at this site from the days of Pi‘ilani to the establishment of the royal residence by Kamehameha III. 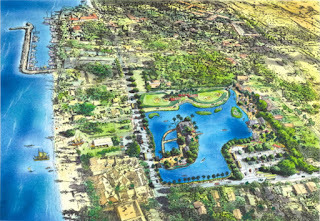 Archaeological and historical investigations demonstrate that the surrounding Loko Mokuhinia pond was the site of indigenous Hawaiian aquaculture and pondfield (taro lo‘i) agriculture. The royal complex established by King Kamehameha III in the early nineteenth century consisted of a large (over 120-feet by about 40-feet,) two-story western style coral block ‘palace,’ “Hale Piula,” on the beachfront of the site (intact from 1840 to 1858). Due to lack of funds, however, it was never entirely completed and only rarely used, and then only for state receptions or meetings of the legislature. Located immediately to the east of this coral block building was the large fishpond Mokuhinia containing a one-acre island linked by a short causeway from Hale Piula. On this sacred island of Moku'ula was a cluster of traditional grass houses (hale pili) that were used as a secluded, private residence for the king and his household from 1837 to 1845. The island of Moku'ula was surrounded by a stone retaining wall, and the causeway to Hale Piula was guarded by a gate with sentries during this particular historic period. The king's beloved sister, Princess Nāhi‘ena‘ena, was buried at Moku‘ula in early 1837. Grief-stricken, the king decided to live next to his sister's tomb for the next eight years. Archaeological subsurface excavations have ascertained that portions, if not most, of the encompassing retaining wall of Moku'ula is still intact beneath about 3-feet of soil and coral fill. Other important features discovered include a preserved wooden pier that extended from the eastern shore of the island into Mokuhinia pond, postholes that might date from the period of Kamehameha Ill's residence, and cut-and-dressed basalt blocks from near the tomb area. The focal point of the complex, however, was a large stone building used as a combination residence and mausoleum. It was built on Moku‘ula in 1837 to house the remains of the king's sacred mother, sister, his children and other close members of the royal family. Bernice Pauahi Bishop, last legal descendent of the Kamehameha dynasty, had the royal remains moved from Moku‘ula to the churchyard at adjacent Waine‘e Church (Wai‘oli Church) ca. 1884. The Friends of Moku‘ula are in the process of restoring Moku‘ula, with the goal of eventually including a Native Hawaiian cultural center. It is becoming a reality. This project has got to be one of the most exciting restoration efforts in a very long time, and a very long time to come. Beneath a County Park in Lāhainā is one of Hawai‘i’s most historical and sacred treasures. Keep an eye on this, because this is a waaay cool thing. Find out more here (and join and/or contribute to the cause:) http://www.mokuula.com. 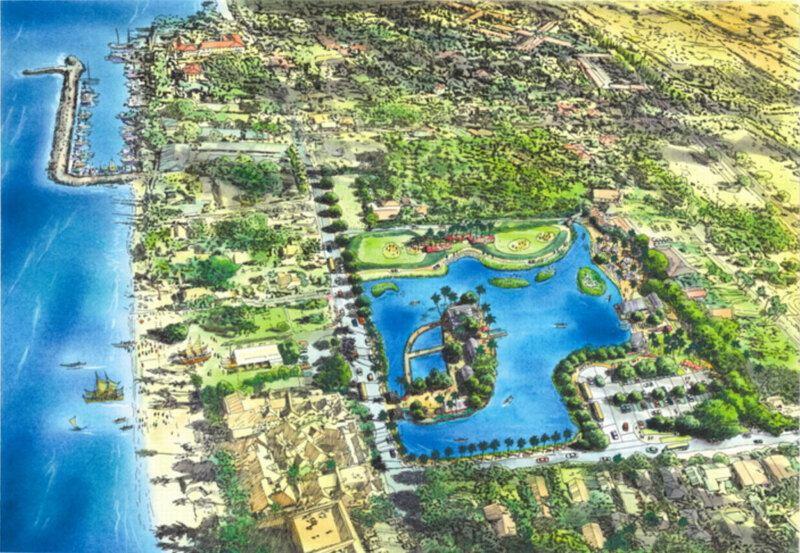 The image is a rendering of the restored Moku‘ula site and surrounding Lahaina. In addition, I have included other images and maps in a folder of like name in the Photos section on my Facebook page.